In 1877 Emma Hart comes to Grand Canyon, a wild, rugged, and until recently undiscovered area. Plagued by visions and gifted with a second sight, she searches for answers—about the tragedy of her past, the betrayal of her present, and an elusive future that echoes through her very soul. 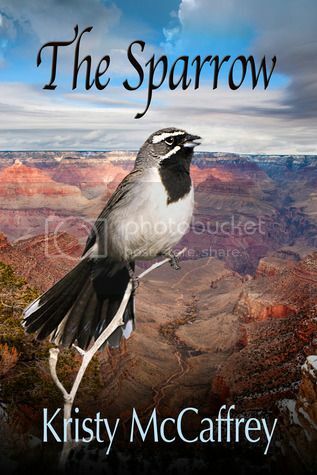 Joined by her power animal Sparrow, she ventures into the depths of Hopi folklore, forced to confront an evil that has lived through the ages. Texas Ranger Nathan Blackmore tracks Emma Hart to the Colorado River, stunned by her determination to ride a wooden dory along its course. But in a place where the ripples of time run deep, he’ll be faced with a choice. He must accept the unseen realm, the world beside this world, that he’d turned away from years ago or risk losing the woman he has come to love more than life itself. I absolutely love McCaffrey`s writing. She melds realities with possibilities to create a love story that (literally) transcends time. It is a phenomenal journey on multiple plains of existence that is still hinged in reality, in real historical events and places. This novel is extremely well written. McCaffrey is a phenomenal storyteller who is not afraid to think outside the box. Everything is presented in complete clarity with a flow that keeps you immersed in the storyline. I absolutely love and commend McCaffrey for the historical accuracy of her stories. They add an extra element of reality and enjoyability to her work. This novel has an underlying current of accepting yourself and your gifts, whatever they may be. She brings some Native American tribes and their vast beliefs to the forefront of this story while melding it with Christianity to create a cohesive whole as the interesting backdrop for this phenomenal love story. The characters in this novel need to look outside themselves to find who they really are inside. That said, even without these undercurrents, this is just a plan awesome story. McCaffrey`s true to life characters follow real belief systems. You can`t help but fall in love with the characters. You hope that they will succeed and reach their end goal, while wanting to help them with the many realistic trials that they face throughout the novel. This is one of those novels that brought tears to my eyes at times and joy to my heart at others. It was a phenomenal read that I`d recommend to anyone who enjoys historical romance, with a hint of the other.